In an intense new documentary film, the consequences of ALS for the former star footballer for Washington State and the New Orleans Saints is chronicled through the family that suffers with him. The documentary, with much of the footage compiled by Seattle cinematographer Ty Minton-Small and cameo appearances by members of Pearl Jam — the Seattle premiere is Thursday at AMC Pacific Place — shines a light on the people most effected by Gleason’s terminal condition: His wife, Michel, his father, Mike, and his young son, Rivers. You will walk away feeling a deep connection to all. Gleason’s backstory — from Gonzaga Prep High School star in Spokane to WSU fan favorite to the special-teams ace that credited with giving New Orleans its first great moment of the post-Katrina era — is neatly summed up over the first 15 to 20 minutes. Quickly it becomes apparent is that this is not a football movie. It even resists presenting itself as a commentary on the physical debilitation of a violent game. Rather, it’s about the aftermath of a tragic diagnosis and its effect on those around Gleason. The film begins with a healthy, energetic, 34-year-old Gleason talking into a mounted camera, with an empty crib behind him. He reveals that he has recently been diagnosed with ALS – Lou Gehrig’s Disease, a condition that progressively destroys nerves and spinal column and has no cure – and then addresses his unborn son, telling him that he wants to give the boy a record of what his father was like. The self-filmed footage dominates the early story, giving the viewer a first-hand look at the degeneration. But the most compelling scenes come after Minton-Small is called in to live with the family and film 24/7 coverage. Gleason contains wrenching scenes. In one, he is so inspired by a faith healer that he tries to run across the front of a church procession, only to fall on his face. In another, he’s so angry with his father that he tries to punch him, but can’t lift his arm. In another, the bedroom scene of a typical marital spat, except this one involves a wheelchair-bound spouse arguing through the use of an eye-movement translation machine. Gleason’s wife, Michel, quickly becomes the central figure of the story. She tries to raise a baby and take care of a dying husband in tandem. The free-spirited wife struggles to keep it all together. The most evocative scenes involve Gleason and his father. Their relationship is, to say the least, complicated. Mike Gleason copes with the news of his son’s condition by becoming a born-again Christian, while Steve is grappling with God’s very existence. At an early point, Steve Gleason declares that one of his goals is to patch up his relationships before he dies. The one that requires the most work is with his father. Mike Gleason something of an antagonist, but his character gains layers as story unfolds. By the end, the viewer finds compassion and aches for a father watching his adult son die. The movie, for obvious reasons, is a downer but gains levity midway through. Just when the viewer can’t handle any more heartbreak, the arrival of a free-spirit caretaker brings a welcome dose of humor. Blair Casey’s initial on-camera interview introduces him as a childhood acquaintance of Steve’s wife, Michel, who agreed to become Gleason’s full-time caretaker because “Michel threatened to kick me in the (groin).” Casey continues to lighten the mood with well-timed tomfoolery when it’s least expected. But most of the film is dark, with hints of heroism and hope wrapped up in all the sadness. 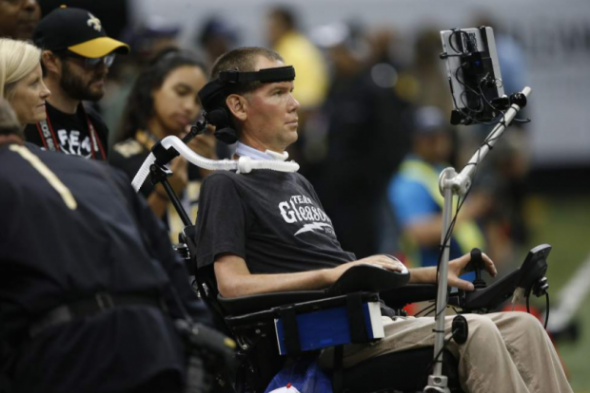 If Steve and Michel Gleason were portrayed as martyrs, it might take away from the impact. Instead, they’re presented as humans – nothing more, nothing less. They’re flawed and vulnerable, and that’s part of what resonates with the viewer. What’s missing from the film is any commentary on the NFL’s history with covering up CTE and other brain issues. Nor is there any mention of the early footage that controversially exposed the New Orleans Saints’ so-called Bountygate. By sidestepping both of those issues, Gleason may lose internet hits but gains storytelling credibility. The filmmakers aren’t trying to make a statement; rather, they shine a light on a tragedy that somehow leaves the viewer feeling some semblance of hope. My first reaction after a viewing at the Seattle International Film Festival was that I wouldn’t feel as much sadness as I would relief when the news arrives that Steve Gleason has died. The toll his life takes on those around him, particularly his wife, is almost unbearable. But with some distance, I can’t help thinking about the images of Gleason sitting in his wheelchair, having lost full use of his body, and the joy he radiates whenever Michel lays Rivers upon his chest. That single image best exhibits Gleason’s will to live. Being a father, and understanding his own father, are enough to carry Gleason through all the agony. How best to sum up Gleason?